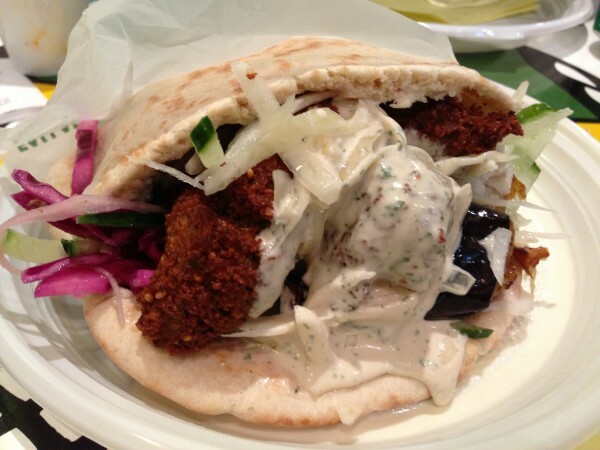 The falafel in Paris is legendary. Any mention of the word brings up Rue des Rosiers in the conversation and usually, L’as du Fallafel quickly follows along with the words “insane”, “best” and “ridiculous”, in no particular order. Let me explain. You get to L’as du Fallafel, wait in line for some time. For us, it was pretty quick – we were in and seated within five minutes of putting out names in. You get a chance to peruse the menu, but don’t take too long to decide. You probably just want to get the classic falafel, house special. Packed to the brim, bursting with juicy ingredients, the pita is hefty and weighty in the hand. 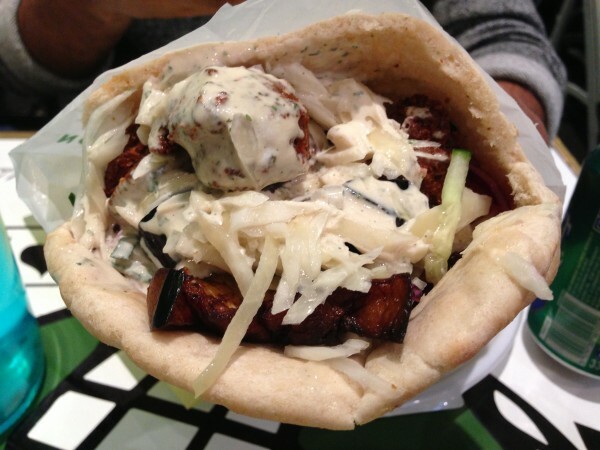 Taking a peek inside, you can see that L’as du Fallafel does not skimp… on anything. The falafel itself contains great crispy chickpea balls, doused in a heady flavor of garlic, smothered with creamy hummus. The veg supporting the falafel alongside include pickled red cabbage, cucumbers and the most amazing eggplant mash. Spicy harissa tops it all off. You might attempt to eat this gracefully, but just I’m telling you right now to give it up. It’s not going to happen. The sandwich is so huge you’re going to be chomping in on it from all angles, sauce and veg all over, politeness and manners be damned. Just enjoy it. 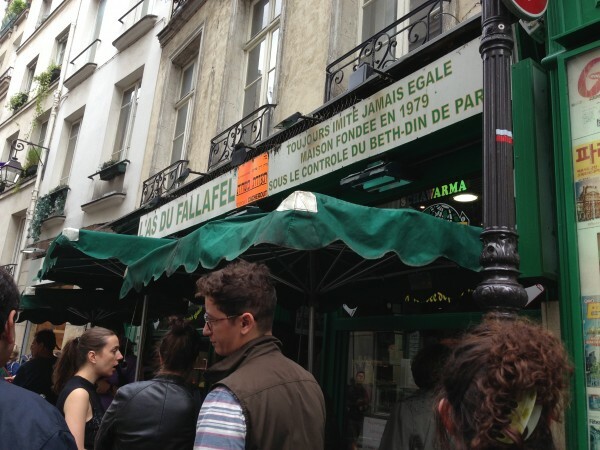 This is the falafel spot in Paris. Do not miss it. Tags: Falafel, France, Israeli, L'as du Fallafel, Le Marais, Middle Eastern, Paris, Rue des Rosiers. Absolutely love the falafels on Rue des Rosiers. Mi Va Mi across the street is great too. 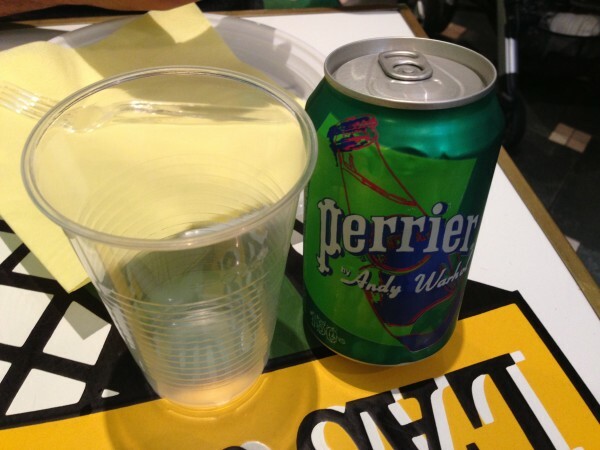 Will have to try it next time! Thanks for the tip.